“You couldn’t pay me to do that job!” Have you ever said that? Some occupations are so gross that most people would never be willing to do them. Jeff Biggs has a job like that, but he likes it. He’s the kind of guy who, as a kid, loved to slosh around in mud after a rainstorm, the kind of kid who loved squeezing oatmeal through his fingers. Biggs’s dirty job is being a sewer inspector. “Believe me,” says Biggs, “gross doesn’t come close to describing it; I creep, sometimes swim, through sewage all day.” City sewers carry household wastewater and storm-drain runoff to water treatment plants. In addition to the unpleasant smells, sewer tunnels are home to creatures such as cockroaches and rats, and these creatures aren’t shy. Not everyone reacts to smells in the same way. Some people are very sensitive to specific smells, and others can hardly smell anything at all. Researchers have discovered that our ability to detect odors is genetic, which means that it is passed on from parents to their children. Every person recognizes smells differently. Strong smells linger because the chemicals do not change easily. One of the most pungent aromas known is that of a skunk’s spray. Getting rid of the smell on a person or dog that has been sprayed can be quite difficult. Some traditional methods, such as bathing in tomato juice, only mask the odor. Other mixtures, such as a mixture of hydrogen peroxide and baking soda, work better because they actually change the chemical composition of the odor molecules, but they can’t neutralize the smell completely. Wetness can bring out a smell that you thought you had gotten rid of. So, a dog might smell OK when its fur has dried after a bath, but when it starts to rain, you might need to hold your nose again! We all know that some foods taste better than others but what gives us the ability to experience all these unique flavors? This simple experiment shows that there's a lot more to taste than you might have first thought. Close your eyes and mix up the piece of potato and the piece of apple so you don't know which is which. Hold your nose and eat each piece, can you tell the difference? Holding your nose while tasting the potato and apple makes it hard to tell the difference between the two. Your nose and mouth are connected through the same airway which means that you taste and smell foods at the same time. Your sense of taste can recognize salty, sweet, bitter and sour but when you combine this with your sense of smell you can recognize many other individual 'tastes'. Take away your smell (and sight) and you limit your brains ability to tell the difference between certain foods. Two scents that are particularly attractive to mosquitoes are carbon dioxide and lactic acid. Both of these chemicals are produced when you breathe or sweat. So, when you exercise, mosquitoes may zoom after you. That’s because exercising causes your muscles to build up lactic acid. Also, your sweat emits carbon dioxide, and your body temperature increases. However, not everyone produces carbon dioxide and lactic acid at the same rate. Some people produce higher levels, so they are more likely to attract mosquitoes. Even your sense of style can affect whether or not you get bitten. Mosquitoes use color to decide where to land, and they prefer dark colors. Wearing a black or dark blue T-shirt is a good way to turn yourself into a giant target for mosquitoes. Wear white, and they might fly right by. Have you ever heard the saying “Leaves of three, let them be”? It’s an old warning to stay away from poison ivy. This shrub or vine, which is found in much of North America, contains a sticky substance called urushiol oil. The oil is so strong that an amount the size of a pinhead is enough to cause an itchy rash on about 500 people! 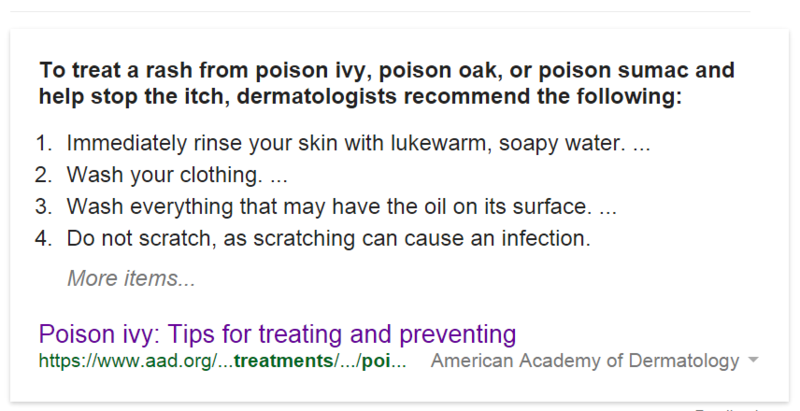 If your skin comes into contact with poison ivy, the oil is very hard to wash off. In fact, once urushiol oil touches something, it can remain active for one to five years. A rash usually develops within a few days of exposure, causing severe discomfort and itching. Many people think the rash itself is contagious and can continue to spread. However, this is not the case. Once the oil has been absorbed into your skin, which usually occurs within 24 to 36 hours, it can’t spread anywhere else. If new rashes do appear, most likely you have come into contact with poison ivy in multiple places, or the oil is on something you continue to touch, such as your clothing or your pet. Instead of trying to treat poison ivy, your best strategy is to avoid it in the first place. The plant is characterized by clusters of three pointy leaves, with the middle leaf being the longest. Before you go camping or hiking, study pictures of poison ivy so you know exactly what it looks like, and whenever you are venturing into the woods, wear long pants instead of shorts, and trade in your sandals for shoes and socks.